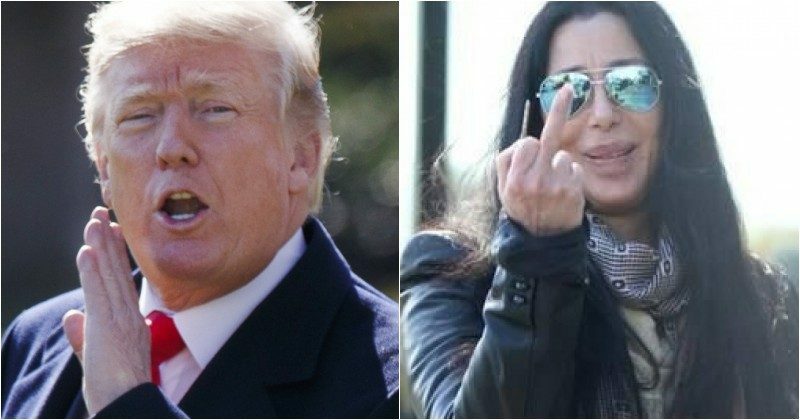 Cher just spilled the beans on her dream ticket for the 2020 presidential election. The 72-year-old pop icon said that she knows “Joe Biden is a really good man” and added that she would love to see him run with someone younger, like Kamala Harris, as his running mate. She thinks they can beat President Donald Trump by a landslide. Well, that’s when the Oscar winner got smacked hard for her choice. You’ll love this. Cher is making her wishes known for the 2020 presidential race. The Moonstruck star is being lauded by the Washington Post as a real political expert, so we should heed her words, right? The Hollywood Trump-hater made it clear that her choice is Joe Biden. “I would love to see [Biden] with someone young,” said Cher, one of President Trump‘s most vocal Hollywood critics. The 72-year-old performer frequently blasts Trump on social media, calling him a “f—ing traitor,” among other less-than-complimentary names, reported The Hill. Pressed on the more youthful potential Biden running mate, Cher — who fundraised for Democratic presidential nominee Hillary Clinton‘s 2016 campaign — mentioned a pair of high-profile California Democrats. “[Sen.] Kamala Harris or — I can’t remember what Swalwell’s first name is,” Cher said of Rep. Eric Swalwell. The 76-year-old ex-VP told The Hill in April that he wouldn’t decide on a presidential run “until the end of the year.” A Biden rep declined to comment on the If I Could Turn Back Time songstress’s remark. This is just another example of a leftist celebrity weighing in on politics, and it’s making most Americans a tad bit fed-up. If Biden does, in fact, become the nominee and if he has delusions that he’ll take on Trump with this type of an attack, we say good luck. The president is an expert at the counter punch, and he towers over the 6-foot-tall Biden at 6’4″. But there’s more. Americans smacked her hard after she voiced her Biden/Harris pick. Biden and Kamala will not beat Trump in 2020. Can you please stay out of politics and stick to what you do best, getting plastic surgery and making horrible music. The last time you were relevant was 3 facelifts ago! Biden is not a great man. He threw Dr Anita Hill under the bus in the 90s when he voted for her sexual harasser to become Supreme Court Justice. He threw Hillary Clinton under the bus by calling her a weak candidate after she’d won the popular vote. Cher may like Kamala Harris or Eric Swalwell for the VP choice, but they don’t hold a candle to Mike Pence. And as for the Joe Biden match up with Donald Trump? What exactly is Biden going to run on? The Obama years? All the president has to do is bring up all the reasons why Americans rejected a continuation of Obama through Hillary Clinton in 2016. Of course, there will be nicknames, too. President Trump can’t pass up giving his enemies nicknames. There is even a Wikipedia page dedicated to the president’s famous nicknames, and Joe Biden’s are “1 Percent Joe, Crazy Joe Biden, and Sleepy Joe.” Cher may get to see Joe Biden run, but Crazy Joe just comes with too much baggage from his Obama years to defeat President Donald Trump.